The differences between Ashkenazic and Sephardic Jewish foods are clearest at Passover. 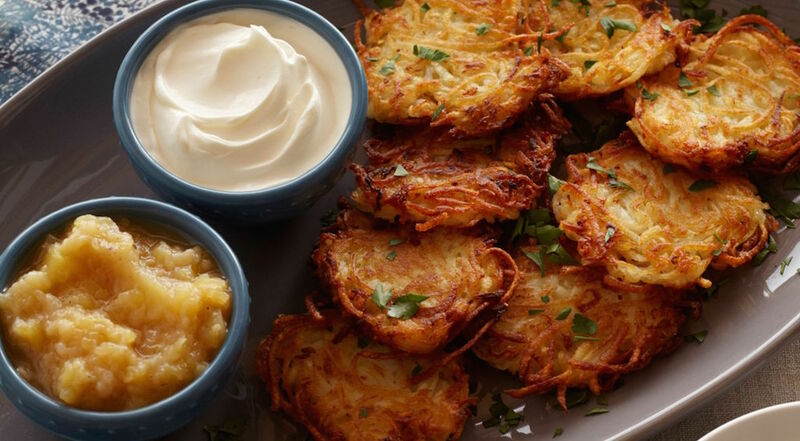 Sephardim traditionally eat rice, legumes and other foods “verboten” to those from Northern and Eastern Europe and Russia, which makes borrowing traditions for an all-inclusive modern Passover table a bit challenging. But an Ottoman lasagna, called Mina, also known as miginas, meginas or mehinas, is easily suited to Jews of every ethnicity and historical identity. By any name, these savory layered matzo lasagnas are found in Jewish cuisine from Egypt to Italy to Greece. And they are anything but new. 1. In a deep saucepan set over high heat, heat 2 tablespoons butter and swirl until it is just foaming. Add half the spinach, 1 teaspoon of the salt, 1/4 teaspoon of the pepper, and with tongs, toss gently in the butter. Cover, reduce the heat to medium-low and cook for 4 to 5 minutes, until just wilted. 2. Add the remaining spinach, tossing to coat. Cover and cook, stirring occasionally, for 4 to 5 minutes, until all of the spinach is fully wilted. Transfer to a colander and drain. When the spinach is cool enough to handle, squeeze out excess liquid. The spinach will have shrunk quite a bit. Set aside. This can be done up to 2 days in advance, and the spinach stored in a covered container in the refrigerator. 3. In the same (now cleaned) saucepan, set over medium-high heat, heat 2 tablespoons butter and swirl until it is just foaming. Add the onions, garlic, 1 teaspoon of the salt, and 1/4 teaspoon of the black pepper and cook, stirring occasionally, for 15 minutes, until the onions are soft and the edges browned. 3. Add the wine, butternut squash, thyme and marjoram and cook for about 20 minutes, until the liquid is reduced in volume by at least half. Set aside. This can be done up to 2 days in advance, and the mixture stored in a covered container in the refrigerator. 4. When you are ready to make the mina, preheat the oven to 350 F. Spray a deep 9-by-14-inch lasagna pan or glass Pyrex pan with nonstick vegetable oil spray. 5. Heat the milk in a medium-sized saucepan over medium heat until hot but not scalded. 6. In the same (again, cleaned) deep saucepan, heat the remaining 4 tablespoons butter over medium heat until it begins to foam. Immediately whisk in the potato starch and quickly add the warm milk, still whisking over medium heat, making sure there are no lumps. Cook for 3 to 5 minutes, until the mixture thickens slightly and comes to a gentle but active boil, adjusting the heat as necessary. 7. Reduce the heat to a simmer, add the crème fraîche and cook, whisking gently, until blended into the sauce. 8. Add about three-fourths of the shredded Gruyère cheese, reserving the rest for topping, and with a spoon, stir until the cheese melts. Add the nutmeg and stir to blend. 9. Spoon 1 cup of the cheese sauce over the bottom of the lasagna pan. Break the matzo into 3-inch wide slats, rinse them under cold water for about 5 seconds, and arrange them over the sauce in a single layer, breaking the sheets at the perforations as necessary. Add the spinach, arranging it in an even layer, and top with another cup of cheese sauce. Arrange another layer of matzo on top and spoon another cup of cheese sauce over it. Cover with the Fontina cheese and the remaining salt and pepper. Add another layer of matzo and top with the onions and butternut squash. Spoon the remaining cheese sauce over the top and scatter the reserved Gruyère over it. 10. Prepare a sheet of foil big enough to cover the lasagna pan and spray it with nonstick vegetable oil spray. Cover the mina loosely with the foil, greased side down. Bake for 1 to 1 1/4 hours, or until bubbling hot. Remove the foil, increase the heat to broil and broil for 2 to 3 minutes, until the top is lightly browned. Serve immediately.